Michigan rockers GRETA VAN FLEET have been forced to cancel the remaining dates on their Australian tour after singer Josh Kiszka came down with laryngitis, rendering him unable to perform. 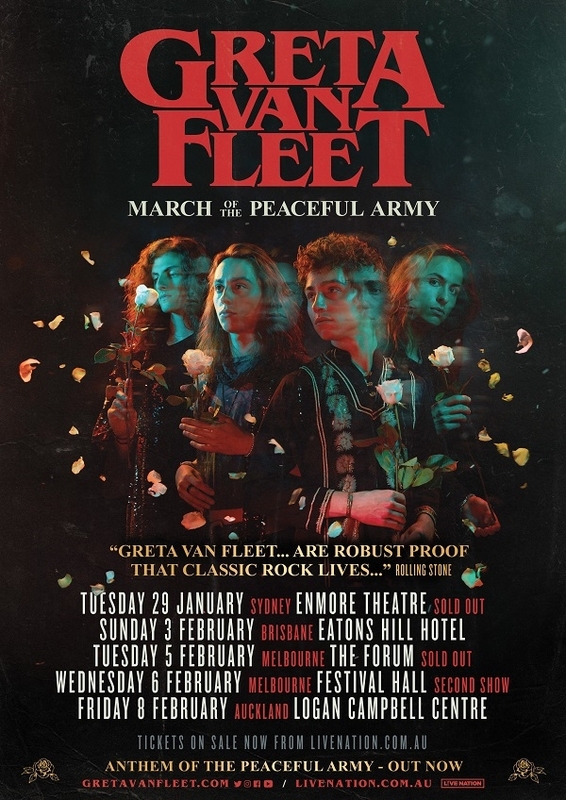 GRETA VAN FLEET played in Sydney on Saturday but scrapped Sunday’s concert in Birsbane before calling off the rest of the tour. “I have some heartbreaking news. Unfortunately, somewhere between travel from the U.S. to Japan and Australia, I developed an upper respiratory infection that has gradually evolved into laryngitis. I’ve been trying to recover, but cannot seem to get rid of it. Doctors have informed me that performing in this condition could cause damage to my vocal cords, which is something that I cannot risk, and therefore we must reschedule our shows tonight and tomorrow. “I am terribly sorry to make this announcement. We are already working on a momentous return to make this up to you and will be announcing that very soon. GRETA VAN FLEET‘s debut album, “Anthem Of The Peaceful Army”, landed at No. 1 on Billboard‘s rock chart and No. 3 on the all-genre albums chart last year. It has also reached the Top 10 in Canada, Italy and Germany. Since its April 2017 breakthrough with the song “Highway Tune”, GRETA VAN FLEET has also put out two EPs and has performed on “Saturday Night Live” and “The Tonight Show Starring Jimmy Fallon”. In December, GRETA VAN FLEET scored four Grammy Award nominations, one for each major rock category — “Best Rock Album”, “Best Rock Song”, “Best Rock Performance” — and a “Best New Artist” nod.